This is a moment of great pride and great peril for American journalism. The democratic foundation set in place by our Founding Fathers is being tested, and an institution they protected with the very first amendment to the Constitution — the press — is providing a bulwark against a government tailspinning toward a depth of corruption and dysfunction rarely if ever seen in this nation’s history. For this service, reporters find themselves in the crosshairs of vitriol and coordinated attacks (“fake news,” “enemy of the people”). This authoritarian rhetoric is damaging our country, and far too many abide it or stand in complicit silence. But these attacks prove the press is an effective check on the naked abuse of power. American journalists are proving their mettle, and we must find ways to make sure this can continue. Future historians will undoubtedly write volumes about this critical period in journalism. And it is up to all of us to make sure that a free and independent press emerges from this maelstrom of invective even more robust. Given this perilous state, we ask what might we as journalists do to strengthen our institutions, and what role might the general public play to that end? We acknowledge that journalism was under great strain long before we ever heard a president whip a crowd into a fervor by scurrilously attacking reporters and news organizations. The culprit for this increased vulnerability of the press for much of the last few decades has been principally economics, namely business models struggling in the face of a digital revolution. The result has been a great hollowing-out of many news outlets, especially local newspapers. For most of the 20th century, the news business was driven by competition; the daily battle was for the big scoop. From city halls to the halls of Congress, reporters working sources were part of the lifeblood of democracy. Now financial pressure has depleted the ranks to such an extent that much of the work of government might as well take place behind closed doors. It is not difficult to diagnose the problems in journalism. How can we create sustainable businesses that can succeed in the digital age? How can we avoid being consumed by stories geared to generate the most clicks? How do we support deep-digging investigative reporting and foreign news? How do we effectively cover local issues or complicated topics like science? How do we ensure diverse voices are heard? These questions defy easy answers, but we cannot afford to give up. We have seen democracy depends on a free press; we can no longer take its survival for granted. Powerful forces have unleashed a strategy of discrediting the media to fuel their rise to power. Seeing an industry already on the defensive, they made calculated attacks to undermine the very notion of objective truth on which a free press is based. Thankfully, reporters are a stubborn lot. Rather than cower, they produced an explosion of top-flight investigative reporting. Lies are being called out as lies. And Americans of all walks of life and across political ideologies are joining in solidarity. We have seen a spike in subscriptions and ratings, especially at the big national news outlets. And the recent effort, led by the Globe’s editorial board, to marshall editorial pages around the country to speak out on the importance of journalism, was particularly inspiring. But we need something more, our own strategy to counter those who are working to undermine a free press. When we talk about what it takes to be a good citizen, we focus on such things as civic engagement and voting. It is time that we add support for the press to that list. Everyone who says they care about freedom and democracy has a part to play. Technology giants like Facebook, Apple, and Google that distribute the vast majority of news these days must figure out how to share some of their stratospheric revenues with the journalistic organizations that are producing the currency of information that makes our democracy — and their platforms — run. 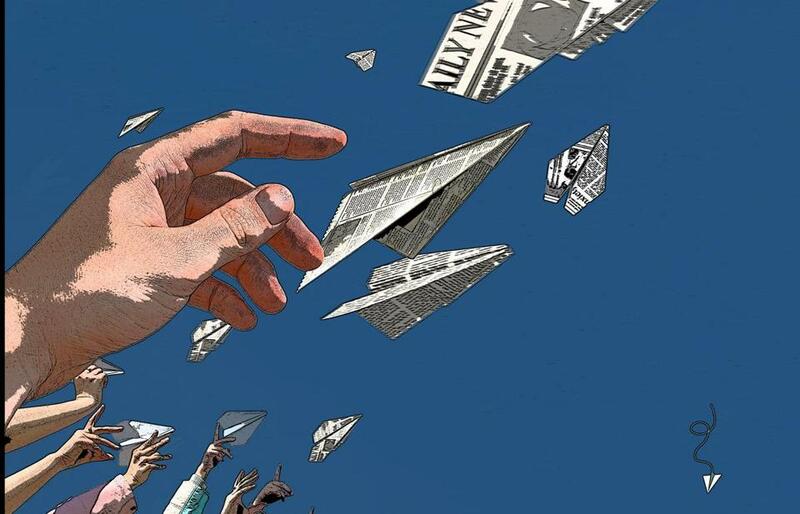 Shareholders and the public must demand that the business conglomerates that own many journalistic operations invest more in news as a public trust. Politicians of all stripes must stand up for a free press, or face the consequences from voters. Philanthropists must be urged to put more of their support to underwriting quality journalism. Meanwhile, the compact between journalists and the public must be renewed. It is easy to generate attention by covering every outrage and tweet from the Oval Office, but all of us in the press must direct more time, attention, and resources to covering a much wider range of topics. We must innovate with our storytelling techniques and distribution strategies. The public must actively seek more varied news streams and support quality reporting by reading, watching, and, most importantly, subscribing. None of us can afford to subscribe to every publication, but as the old saying goes, for the price of a cup of coffee a day, we can support a lot. Particularly seek out local newspapers, which have long been the fertile ground from which stories grow to a national level. They are in particular distress.